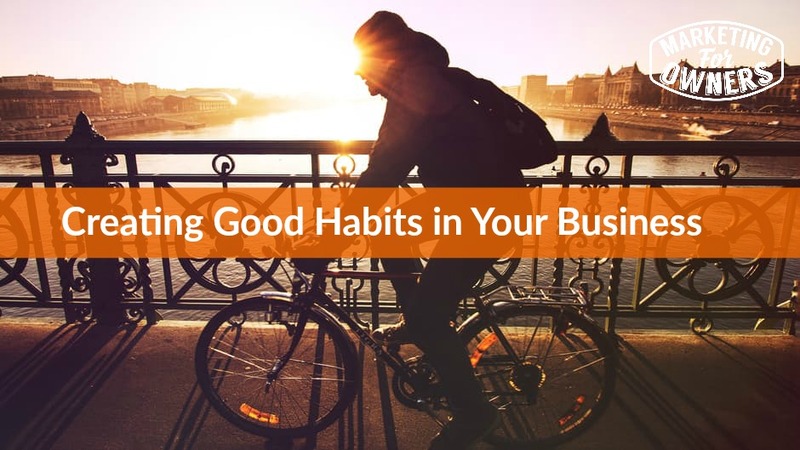 Creating habits, as long as they are good ones and not bad ones can be beneficial for your business. I am a generator of habits for my business so today I am going to share how those can help you out in your business life. What you need to do is think about these things and what you associate them with. For example, when you get up in the morning, when do you work out? Do you do it in the morning when you first get up, or mid afternoon? What about in the evening? You quite often associate something you do with something else that you do regularly. Translate that to work and it could help you to not work so much, or be a reminder to take extra breaks throughout the day. This could help you in so many ways. For example — say that you are the workaholic type that will come in early in the morning and get started right away at your desk. You have one of your staff bring you a cup of coffee and you stay there, in your chair, working all day long. That is not good for your eyes, your health, or anything. You can use this as a way to help remind you to get up and take breaks throughout the day. During those breaks, you can go for a walk outside, get some fresh air, walk up and down the stairs, etc. We talk about dieting when we are at home and we try to eat better at home, but what about at work? our food habits are not so good when we are at work. There are other things you can do too, and those are the ones I really want to talk to you about. You should be engaging with your audience and your following of people on social media. Set certain tasks that you will do every day to help connect you to those people. Some of the things might be — make it habit every morning when you come in and sit down and turn on your computer to connect and direct message 5 people on Twitter. Or — how about looking through your past customers on social media and phoning one up and find out how they are or if they need anything. You might only associate appointment times on your calendar with customer meetings and such. However, you can use those appointment times to block out time to do certain things that are not even associated with customers or clients. You can make an appointment with yourself to go for a walk, do some exercise, have lunch with a friend, etc. Block out time for yourself. It works by doing this. Think of the way you develop good habits at home and apply that your business. Think of those things that you regularly do and then apply that to the new things you want do do at work. Things like sending out a new email to a client, creating weekly videos, contacting clients through social media and then make an appointment with yourself until it becomes a habit. Tomorrow is our expert interview series. Make sure you tune in tomorrow because you are going to love it! Then I will be back Thursday with another tip for you.